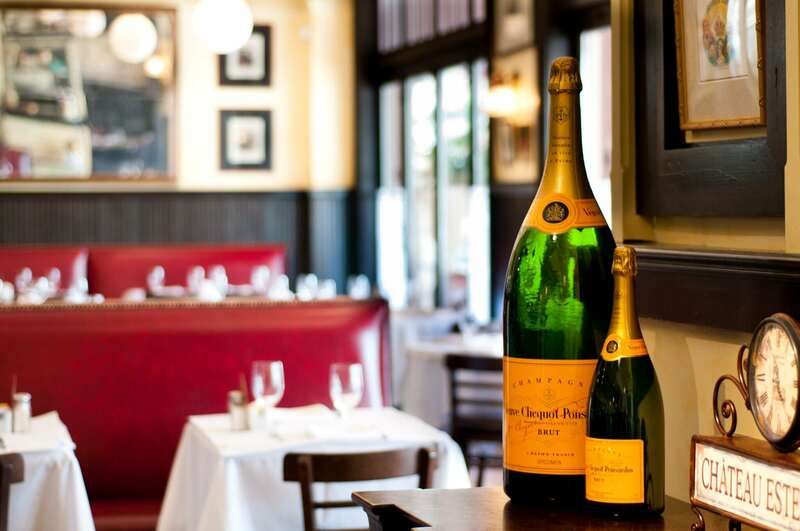 Bienvenue to the first of a new weekly series I’m starting titled “Friday Night Out,” where I’ll share some of my favorite local spots for that celebratory hello-weekend meal. 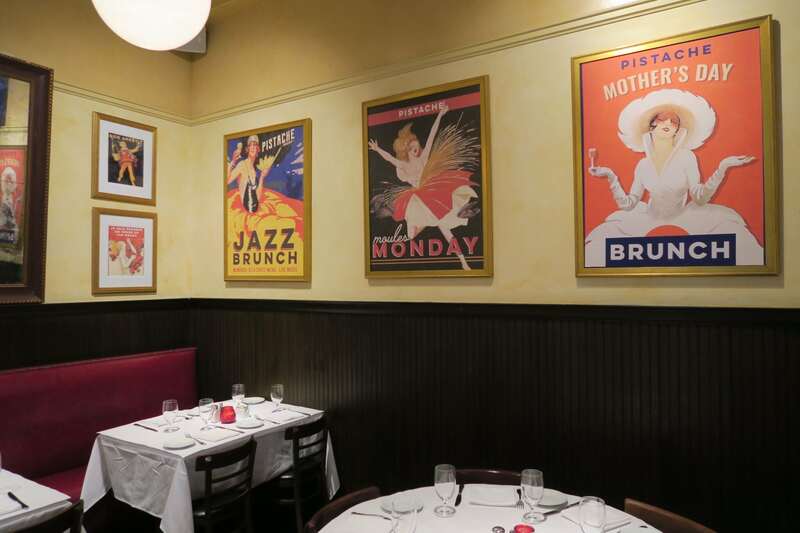 Located on the eastern end of Clematis Street, with Intracoastal views from the outdoor dining area and a sophisticated yet inviting atmosphere tucked inside its doors, Pistache French Bistro is one of those places that hits the spot, any time of day. Somehow, this one restaurant shines for every kind of meal: brunch on the weekends, al fresco lunches on weekdays, candlelit dinners in the warmly decorated bistro-style restaurant, and even late-night snacks and cocktails at the bar. 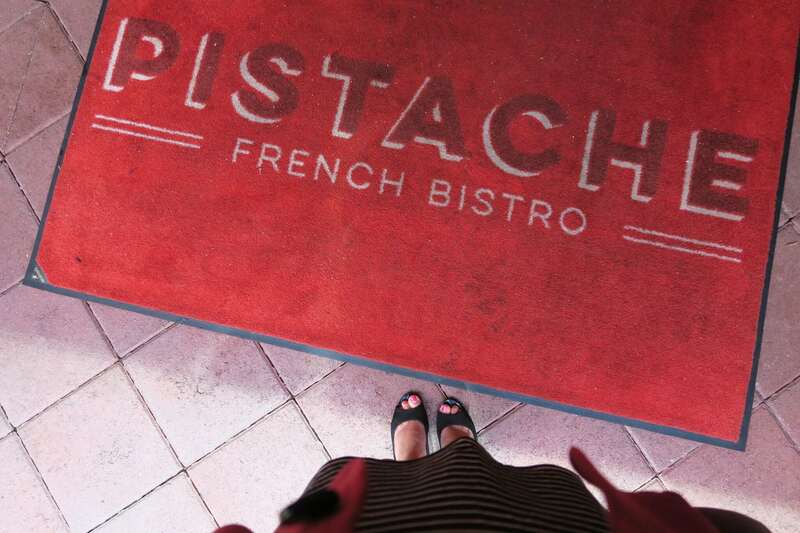 I especially love a visit to Pistache before or after a play at neighboring Palm Beach Dramaworks. 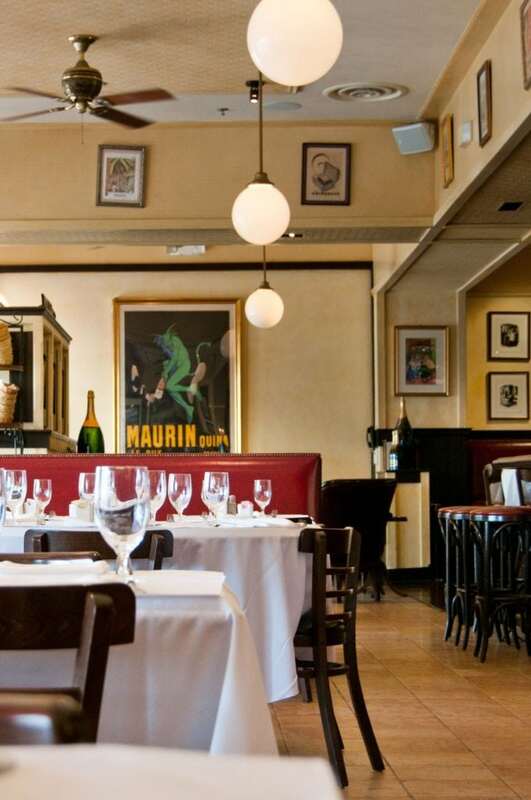 Pistache is a perfect blend of authentic French bistro and modern cool. 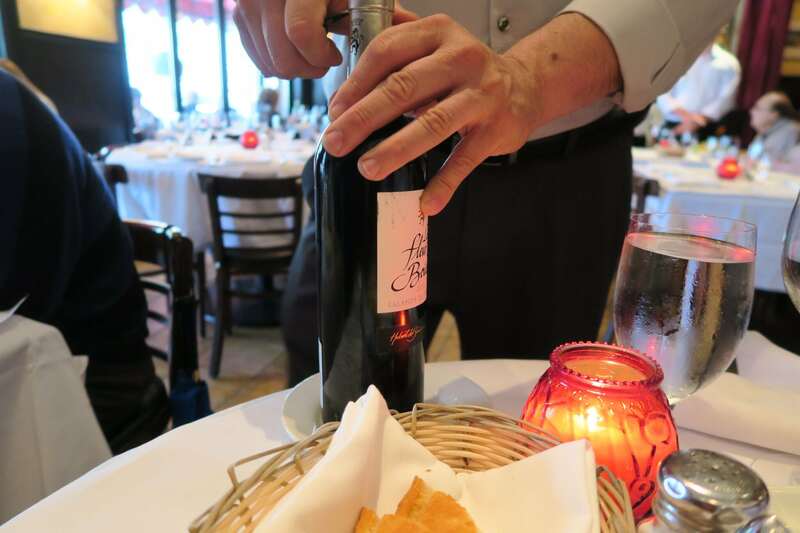 You’ll find all your favorite French dishes on the menu, but usually with a fun twist that makes them fit right in on a South Florida street famous for its vibrant nightlife. Case in point: the frite sheet. 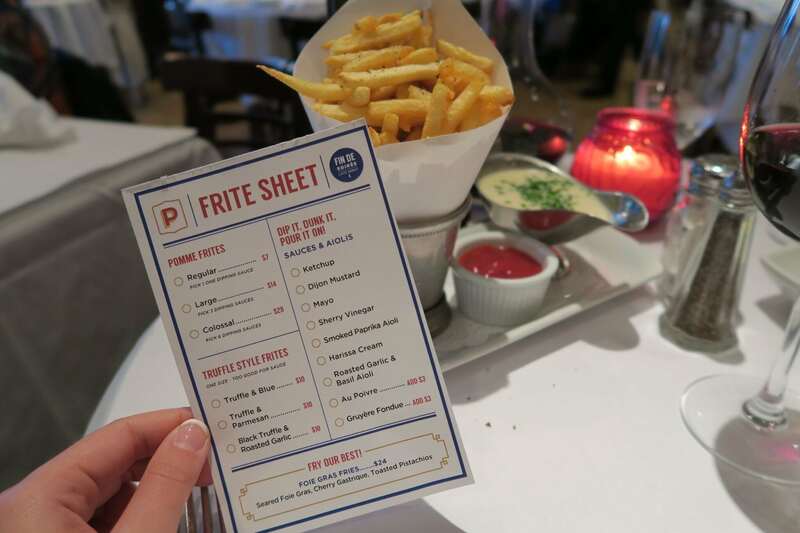 A late-night special, the frite sheet is a little checklist from which you can choose several different types of fries and accompanying sauces and aiolis. My combination of choice? Classic pommes frites with Gruyère fondue. Yum. 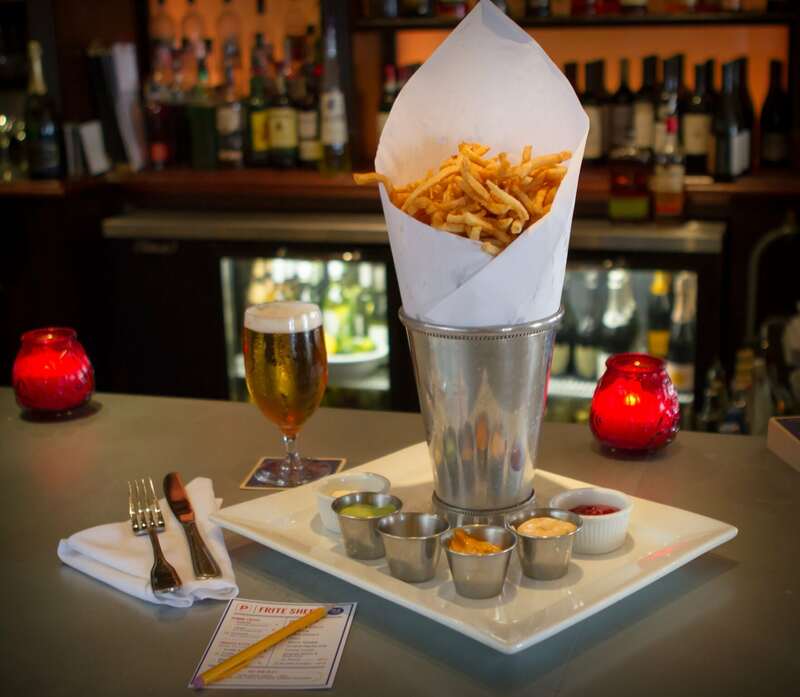 Typically a late-night offering, the frite sheet is available any time of day if you ask nicely. Adorned in vintage-looking Art Nouveau posters, a style popular in France in the early 20th century, Pistache boasts a cozy yet elegant warmth that draws you in to enjoy the simple pleasure of sharing a meal. You’ll find yourself wanting to linger, as the French do, for just one more glass of wine. 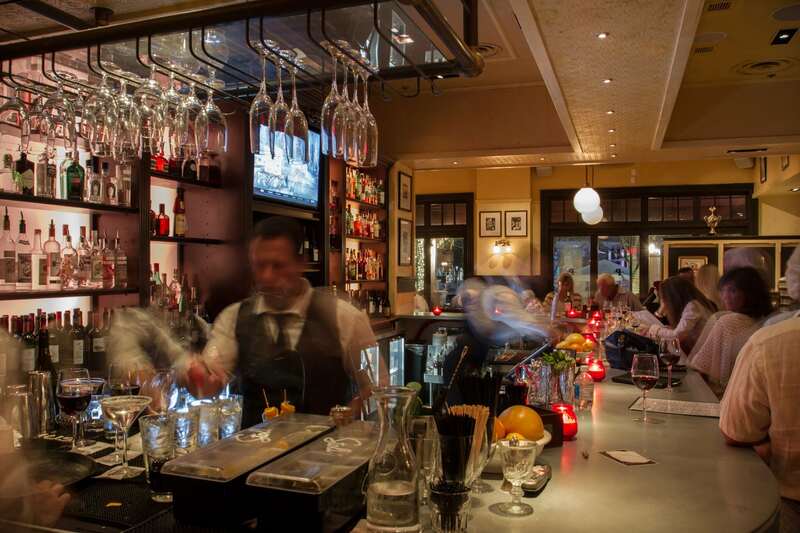 Though it’s a fun place to take friends, it’s the ideal spot for a night out with someone special. They look vintage, but the posters actually advertise the current happenings at Pistache! 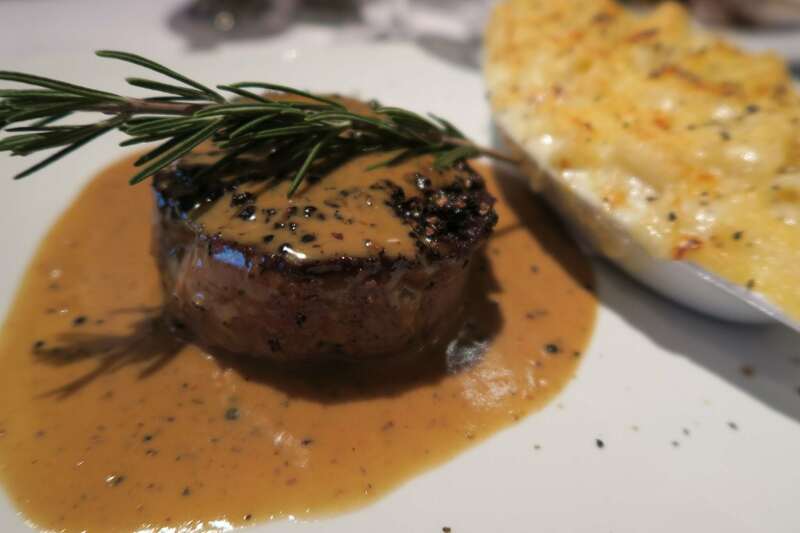 On our most recent visit, my husband and I laughed about ordering the same entrée–filet au poivre–because it was a dish we discovered during our time in France and couldn’t stop eating (we ordered it almost nightly!). We chatted over a bottle of wine (a perfectly paired Bordeaux selected for us by the in-house sommelier), tucked into our burgundy leather-tufted booth off in a quiet corner, reliving our memories of visiting Paris and dreaming together about future visits to destinations unknown. 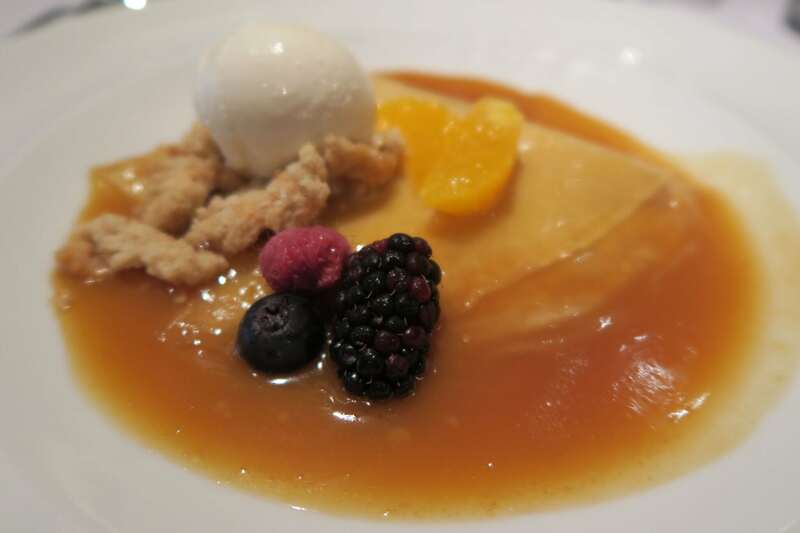 We broke bread, devoured a side of truffle mac & cheese, and somehow managed to top it all off with crêpes suzette–a mouthwatering concoction of soft crêpes, caramelized orange butter sauce flambéed in liqueur Bauchant, and a scoop of vanilla ice cream. Talk about a date night to remember! Bread and red wine–the good things in life. 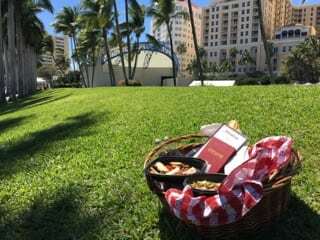 Belly full of baguette and wine and cheese, ears ringing with good conversation, a soft smile brought on by the simple but most exquisite pleasures life has to offer, you’ll begin to wonder… Are you still in West Palm Beach? Or have you wandered off into the idyllic streets of France, a starry Midnight in Paris-esque night ahead of you? Pistache is a dream you won’t want to wake up from, an imported dose of joie de vivre in the midst of the hustle and bustle of South Florida living. Reserve your table by visiting OpenTable or calling (561) 833-5090. See below for upcoming events. 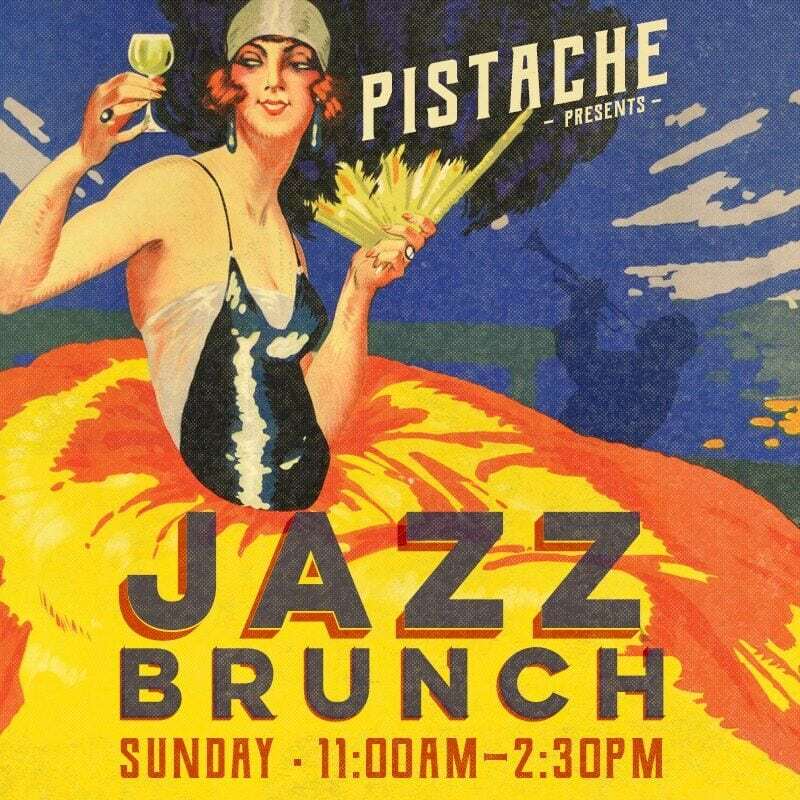 As if the food and atmosphere weren’t enough, Pistache also presents regular events and happenings, including a Sunday Jazz Brunch, all-you-can-eat mussels on Moules Mondays, half-off bottles of wine on Wine Down Wednesdays, and unlimited rosé on Saturdays. Their upcoming Bonjour Summer series features monthly themed Tour du Monde dinners with global-inspired menus and live entertainment plus Le Marché, a weekly “Friday night street market” event with different stations offering traditional French street food. And if you’re more of a “Saturday morning” kind of person, Pistache has pre-packed picnic baskets available for rent! You can take them out to enjoy an intimate dining experience along the waterfront or another beautiful spot of your choosing.